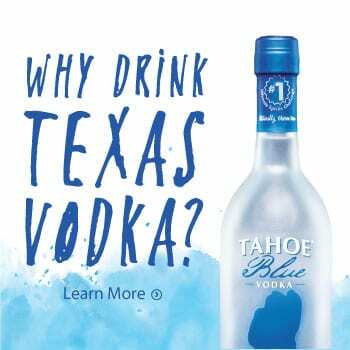 Here in Tahoe, we are located in a slice of California that’s somewhat removed from the rest of the state. It’s a point of pride to explain to outsiders that, yes, it does snow in California, and the skiing is just as great as the surfing. Last year, when Hollywood led the conversation on #MeToo, way up here in Tahoe, women were also making a statement of solidarity, strength and power in the mountains. Tahoe has long been a stronghold for women athletes who have evolved skiing and snowboarding and paved a path for others to follow. We have raised Olympians and World Cup ski racing champions. The woman threading the needle in the Cirque at Kirkwood and running laps on Squaw Valley’s KT-22, she’s also the star of the ski movies. 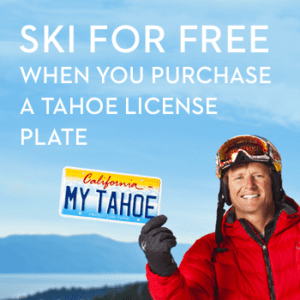 Tamara McKinney, Julia Mancuso, Michelle Parker, Maddie Bowman, Jamie Anderson, Ingrid Backstrom, Kimmy Fasani—these are some of the biggest names in skiing and snowboarding, and Tahoe has shaped every single one of them. But the strength and vibrancy of women in Tahoe run even deeper, to the grassroots level. She is the senior ski patroller who is mentoring rookies on snow safety protocol. She’s the local ripper who is now competing internationally and runs a business on the side. She’s the mom who just dropped her kids off at school and is booting up in the ski resort parking lot at 9:30 a.m. on a weekday. Now is her time to shred. In many ways, skiing has made me a feminist. Skiing is my source of joy, and it gives me the energy and inspiration to draw from and do my best work, have the tough conversations, stand up for what I believe is right, dream up new goals and heights. This sport has long been the domain of men—flip through the pages of a ski magazine and most of the photos are taken by men, of men, and for men. I know. I worked for five years as an editor at a ski magazine. But thanks to the contagious empowerment women find as skiers, there’s an energy boiling up in the mountains that has the pull to create change. It used to be that women were few and far between in ski towns. Now, ladies in Gore-Tex are part of the regular cast of characters in early morning lift lines on powder days. The female contingent is, perhaps, more elusive than the dude-bro gangs. We ride in packs when we find each other, and on those days, lady shred becomes the envy of every man. But more often, we see the woman skiing solo under the chair line, gracefully linking turns and signing her mark into the snow with a ponytail whipping up from underneath her helmet. She’s the one with a good story to tell. These are a few of those women. In the spring of 2014, Meghan Kelly packed her skis and flew to Iceland. There, she met up with five other women and embarked on an adventure to sail and ski in the Arctic. The team set sail across the Denmark Straight to the tip of Greenland, where they climbed and skied couloirs that plunged from mountaintops to seaside. The trip was a pinch-yourself adventure. “Sometimes I can’t even believe that was real,” says Kelly, thinking back on her time in Greenland. Perhaps it was the beauty of skiing in the Arctic, or the camaraderie of six women on a boat, or watching the dynamics between Martha and Pip Hunt, the mother ski guide and daughter pro skier who were also on the trip. Whatever it was, soon after Kelly came home, she got pregnant—with triplet boys. Obviously, the news that she was pregnant with triplets had an effect on Kelly and her husband, Pat. After the first ultrasound, Kelly says she went into planning mode while her husband started panicking. Beacan, Declan and Cormac were born in March 2015, which means they are toddlers now—adorable, melt-your-heart troublemakers. They’re also learning how to ride bikes, swim and ski. As all parents can relate, time has taken on new meaning for Kelly. Before she was a mom, Kelly was skiing 100-plus days a year and getting regular days in the backcountry, going after 5,000 feet of vert in a day. She’s a diehard telemark skier, something she’s held onto when most other tele skiers locked down their heels and traded their setups for Dynafits. 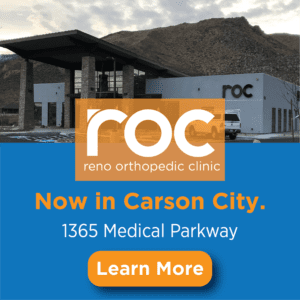 She is also a rallying force for women in skiing, leading the SheJumps chapter in California and organizing women’s ski events in North and South Lake Tahoe for several years before having children. Oh, and as a civil engineer, she works a full-time job protecting Lake Tahoe’s environment. Balancing skiing and motherhood is probably a lot like balancing a high-powered job and motherhood. You can do both, but it’s exhausting. Eventually, you may realize that your priorities have changed—and that is a great thing. Even after her sons were born, Kelly kept up with the backcountry skiing, the peak bagging and the ski trips. 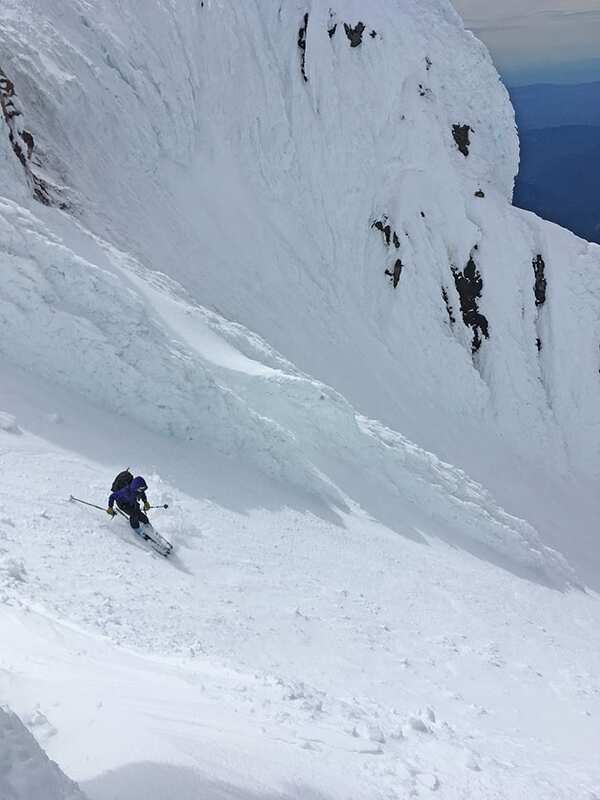 Two winters ago, Kelly skied three California 14ers—Split Mountain, Mount Langely and Mount Shasta. It was amazing—and exhausting. Last winter, she left a ski trip to Revelstoke early to come home and be with her sons. 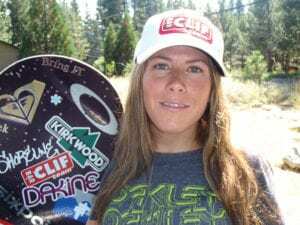 At the end of August, professional skier Elyse Saugstad had just returned home to Tahoe City from Argentina, where she wrapped up shooting for a Matchstick Productions ski movie with three other women—Tahoe local Michelle Parker, Utah skier Angel Collinson and Canadian Tatum Monod. 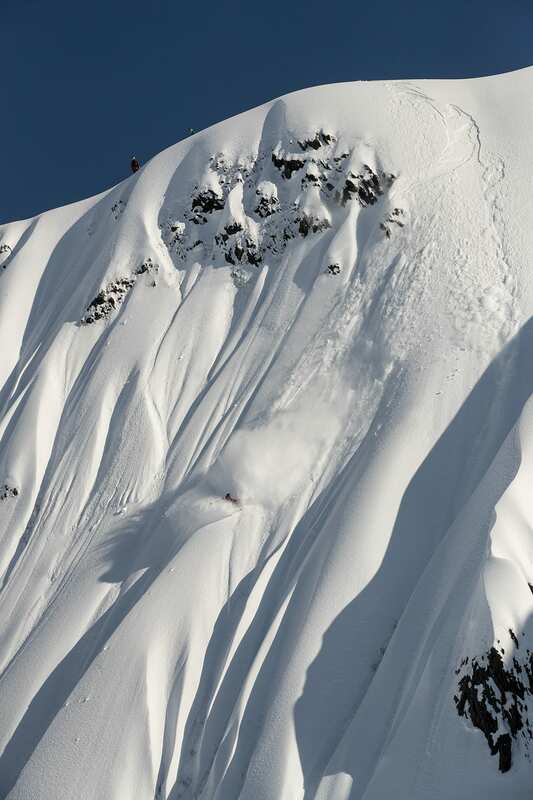 In Argentina, Saugstad skied a straight-line down a massive face that was easily more rock and ice than snow. She says the feature was especially challenging from a mental standpoint. Monod, who stood at the top of the line with Saugstad, and Saugstad’s husband, Cody Townsend, who is also a professional skier and filmed for this movie too, were the “extra bit of inspiration” to help her rise to the challenge. Every year since 1995, Matchstick Productions (MSP) has produced a ski movie. For the most part, those films are entirely cast with male athletes, and maybe a female skier or two. This year, though, there are just as many female skiers as men, and the women are taking the lead roles. The shift was triggered when a group of professional female skiers, including Saugstad and Parker, pitched the idea to MSP. It’s a huge step forward for women in skiing—and action sports at large—and represents significant progress on how women are portrayed in ski movies. Just don’t mistake it for a “women only” ski movie. 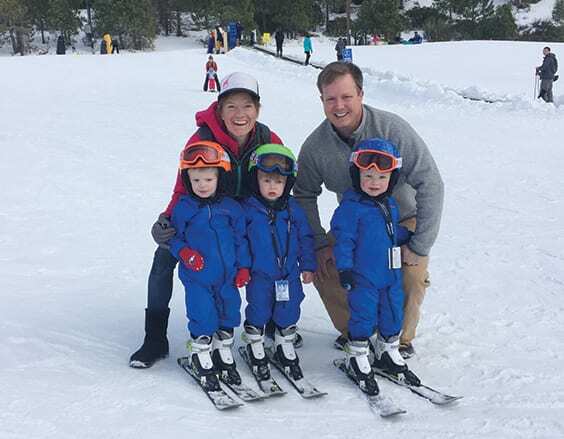 A third-generation Alaskan and ski racer from a young age, Saugstad moved to Tahoe in 2005, soon after she graduated from University of Nevada, Reno. Skiing at Squaw Valley after college was hugely influential, especially for the women she came to know on the chairlifts. Pro skier Jamie Burge, in particular, was pushing the limits for women in skiing and was a role model for Saugstad. Now, Saugstad is the role model many girls at Squaw Valley look up to. In 2008, Saugstad won the Freeride World Tour, and after, she has gradually transitioned to filming and shooting photos. Last year was the first devoted entirely to filming with major ski production companies, and Saugstad worked with MSP and Teton Gravity Research. This year, filming for MSP’s movie and pushing forward a message of equity and inclusion to the skiing and action sports world is even sweeter. “When you see a woman doing something impressive, it gives you the inspiration to push your own boundaries,” says Saugstad. When Hazel Birnbaum turned 18, she delayed college for a move to Lake Tahoe and a job on Kirkwood’s ski patrol. That first winter dumped snow and set the foundation for Birnbaum’s hard-charging, aggressive ski style that propelled her to the most elite big mountain ski competitions in the world. Birnbaum was one of a handful of woman on the ski patrol, but the experience gave her a solid work ethic and a thick skin. 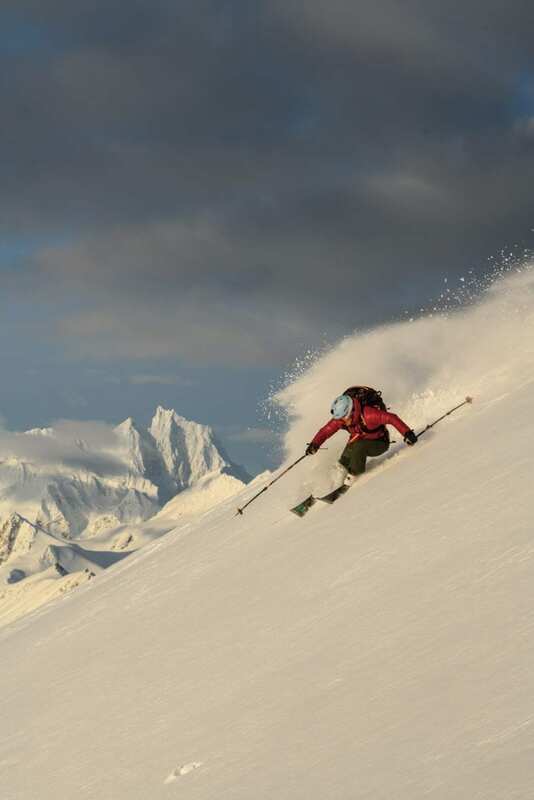 The mountain’s Cirque and challenging terrain also gave her a playground that equipped her to ski the most rocky and exposed faces in the world in competition. In 2015, when she was still a rookie on the elite international big mountain competition circuit, the Freeride World Tour, Birnbaum showed the world what she was capable of. Skiing down Verbier, Switzerland’s famous Bec des Rosses, Birnbaum linked snowfields with fast, aggressive turns and directional airs over two-story-high cliffs. The Verbier Extreme is widely considered to be the most famous and prestigious event on the Freeride World Tour, and Birnbaum landed in first place. “It’s the venue that you go big or you just don’t even show up,” she says. 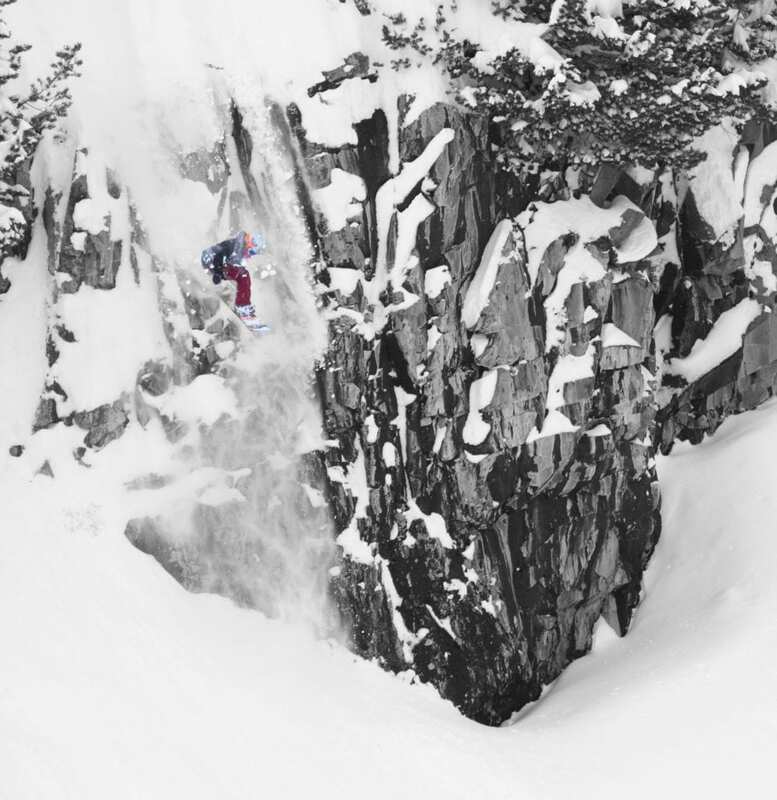 This year will be Birnbaum’s fifth on the Freeride World Tour. She lives in South Lake Tahoe, but for the bulk of winter skiing takes her overseas to some of the biggest mountains on the planet. 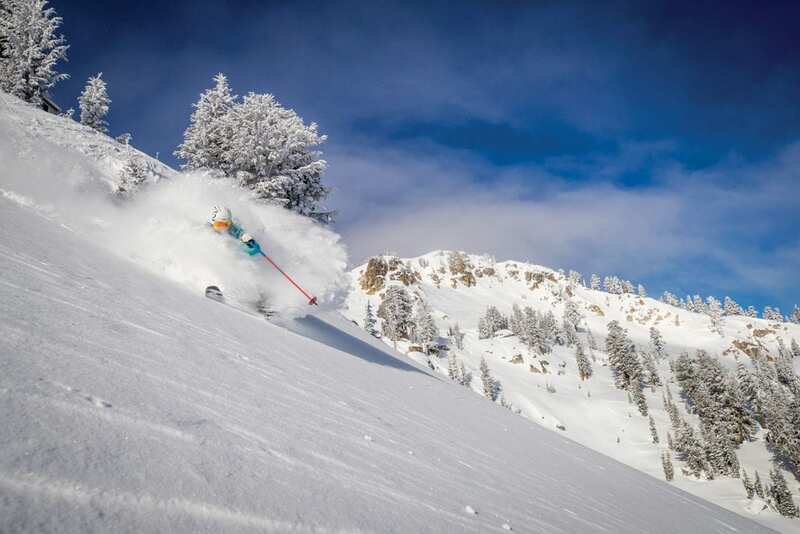 Like her days on Kirkwood’s ski patrol, the Freeride World Tour is also an environment dominated by men. Now, though, at 32, Birnbaum says she has found her voice and knows who she is. When she’s not on skis, Birnbaum’s self-expression manifests through her new business, a popsicle rickshaw cart that’s towed by a bicycle. 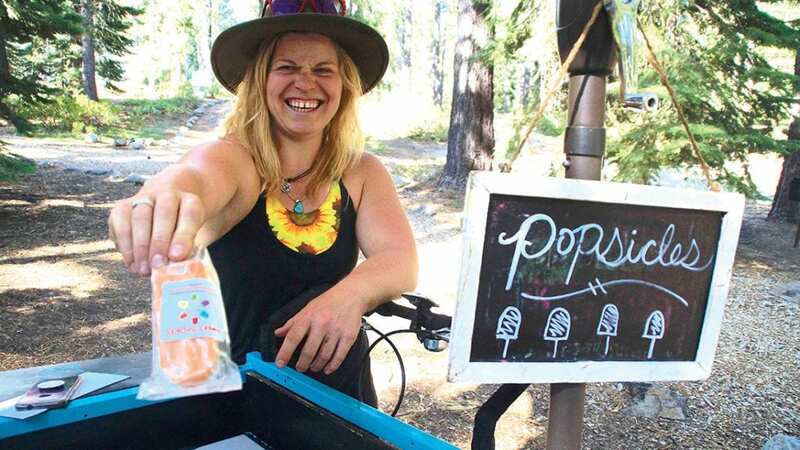 It’s called Sweet Spokes Pops and Birnbaum makes organic popsicles to sell at events all over the Lake Tahoe Basin. Rose Daiek arrived in South Lake Tahoe in November 1994. Born in Ontario and raised in Arizona, Daiek was working at Club Med in Colorado when a friend told her about Kirkwood’s deep snowpack. Her first day in town, Kirkwood shut down for three days because it snowed 9 feet. “I remember driving in once they finally opened up and being like, ‘Oh my gosh, we’re going to ride that?’” Daiek remembers. She camped out in her car that season and snowboarded pretty much every day. Her second season, she upgraded her campsite to an abandoned and condemned water tower. She slept on a Therm-a-Rest, a down comforter, a sleeping bag and another down comforter. It was a secret spot where she’d get some shut-eye between snowboarding and working the night shift as a janitor at Kirkwood. It was a bachelorette’s palace and cost her nothing, which afforded her endless amounts of time to ride. “Snowboarding has just shown me what it is to be completely free,” says Daiek. During the 1990s in Tahoe, other women snowboarders were few and far between, says Daiek. She remembers seeing two girls send a huge Hollywood air. She didn’t recognize them from the chairlift, but they were friends soon enough. That’s probably because they grew up watching Daiek’s example. She’s a master of beautiful, powdery turns and jumping off everything in sight. “I used to just huck my body off of everything,” she says. As she’s grown older, and has a husband, a business, a mortgage and a son, Daiek has become more calculated. But that’s not to say she’s holding back. A Vermont-born ski racer, Wry was grossly understating the full scope and devastation of her injury, as well as the raw willpower she had to muster to make a full recovery and come back to patrol. Her broken leg was actually close to 50 fractures, an “explosion of bone,” in her words. That she made a comeback to skiing, let alone ski patrol, in one year is nothing short of a “miracle,” says Wry. Once again, she understated the work—physical rehab and mental resiliency—she invested to get back to 100 percent. Wry grew up skiing at Smuggler’s Notch, where her father worked as the mountain manager. In fall 2010, after she graduated from Vermont’s St. Michaels College, she moved west to Tahoe with her boyfriend. 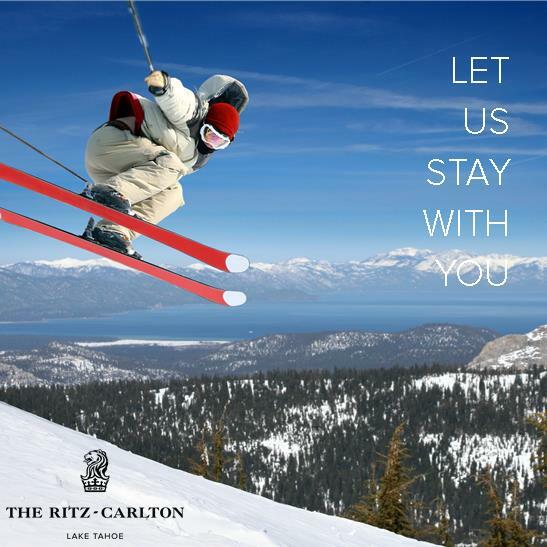 They settled at Kirkwood for the resort’s famously deep winters and, compared to the other ski resorts in Tahoe, more remote location. She started patrolling the following winter in 2011, in a rookie class of three, all women. On the side, the former ski racer was competing in Daron Rahlves’ Banzai Tour and got recruited to enter the Arctic Man, where ski racers are towed behind a snowmobile on a course north of Fairbanks, Alaska. She was in Alaska, training for the Arctic Man, when she broke her leg. “I hooked a tip going 65 behind the snowmobile,” says Wry. She went head-over-ski-tips and tomahawked 100 feet. When she stopped, her foot was at a 90-degree angle away from her knee. Five miles away from the base camp and a helicopter, she corrected her leg herself. After surgery in April 2016, Wry was directed to not put any weight on her leg for three weeks. Her physical rehab started in the pool and gradually progressed. 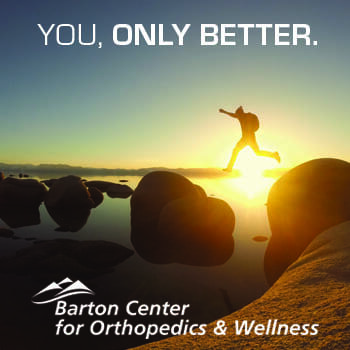 For an athlete of Wry’s caliber, staying sane without physical activity was perhaps the harder part. She meditated, kept a journal, went to acupuncture and enrolled in the community college to take biology and anatomy classes. 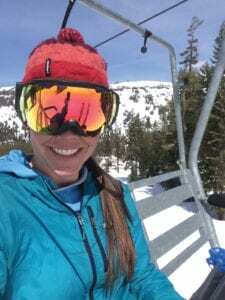 Going into her seventh season on Kirkwood’s ski patrol, Wry’s recovery proved to be foundational in teaching her to respect and nourish her body. She’s out with patrol at the first light of dawn making snow safety rounds and skis until the light fades from the sky, when patrol is the last to leave the mountain. Being a professional skier is not all bright blue powder days. The daughter of a ski photographer, Amie Engerbretson knows this well. 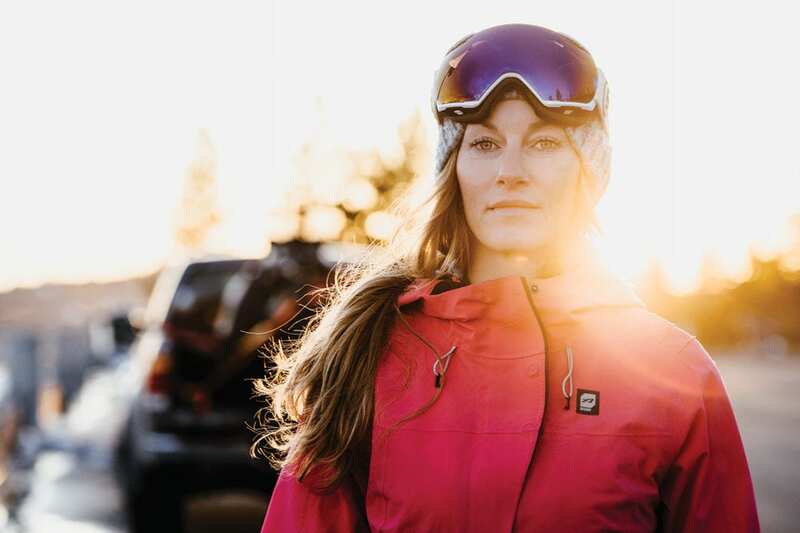 Raised in Truckee by her father, Jeff, who has shot with a spectrum of local athletes and published photos in ski magazines like Powder, Amie has had backstage access to the lives of professional skiers. She has always been surrounded by men and women who make their living off of skiing. From an early age, she understood intuitively the business of skiing, and how it opened doors to travel, lifestyle and the best skiing in the world. She also saw career-ending injuries and women whose ski careers faded as soon as they got pregnant. The most successful skiers, she says, were the people who leveraged their athletic talent into an opportunity to learn other professional skills. Now that Amie is earning a paycheck from skiing and spends her winters chasing snow across the Northern Hemisphere, she’s taken to heart the long view. Nowadays, being a professional skier means being a marketing professional and brand manager. That’s true for men and women. 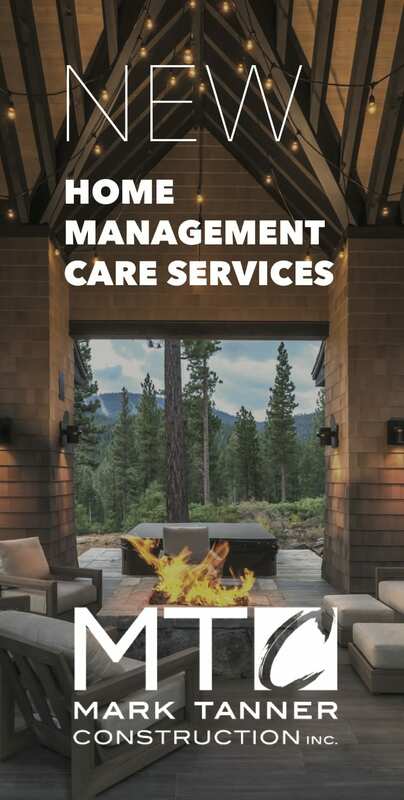 “If you can market yourself, you can market anything,” says Engerbretson. Thanks to social media, not to mention videos, events and photo shoots, never have professional athletes been given as big a platform to excel as today. 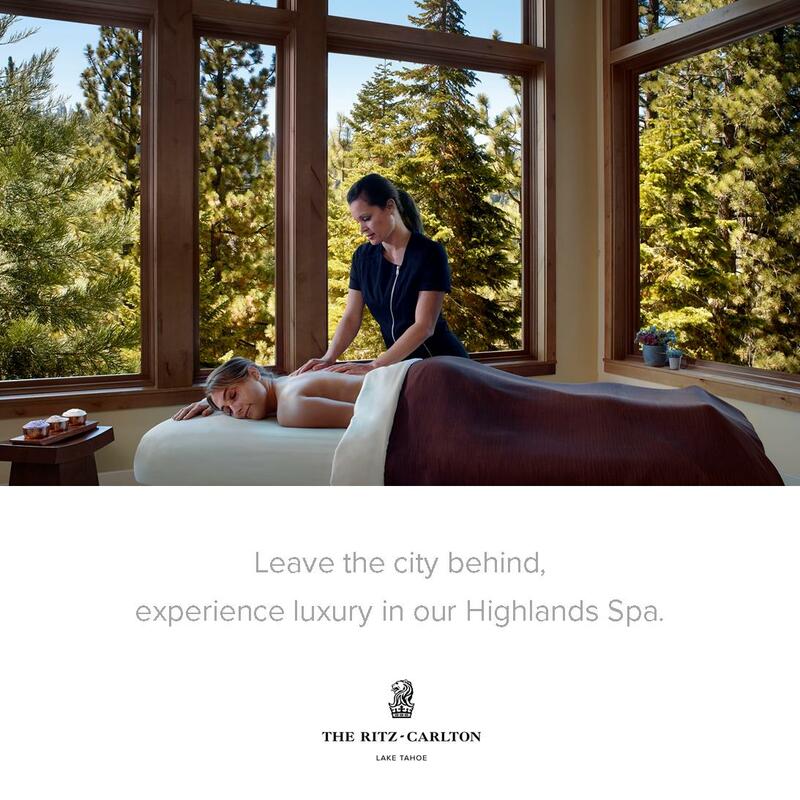 And Engerbretson is a pro—she’s a familiar face on ski resort billboards and lift tickets, she hosts the Red Carpet at the annual Powder Awards show that recognizes the best talent in skiing and ski movies, and behind the scenes she’s negotiating contracts with her sponsors and has ideas for television shows, a creative agency, storytelling projects and producing branded content. If her powerful ski turns are an indication of the drive within, Engerbretson’s career is on a trajectory for the highest peaks. Skiing, though, is the foundation. All of her experience comes back to the slopes. This is where she was born and where she developed the talents and skills that she will take with her for the rest of her life. 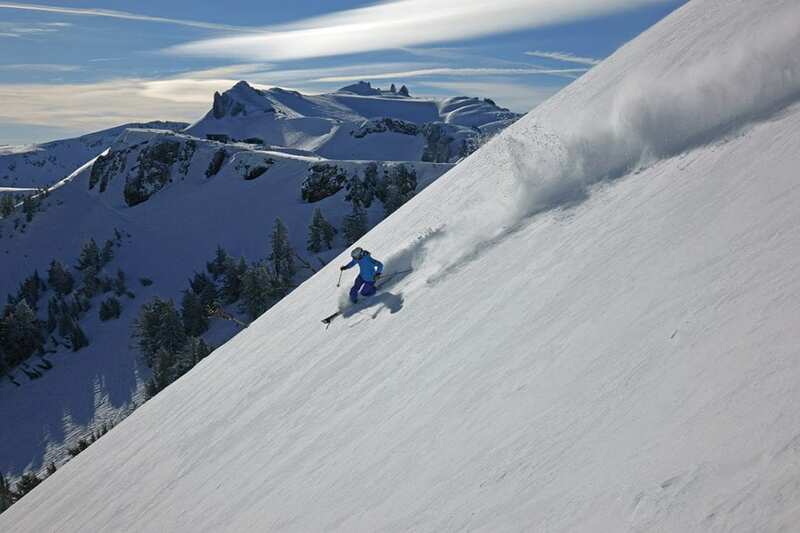 Julie Brown learned to ski soon after she could walk at Squaw Valley. A former editor at POWDER Magazine, she writes about feminism, skiing and the environment. Go Katie Wry!!! Great article. She truly is the Comeback Girl.